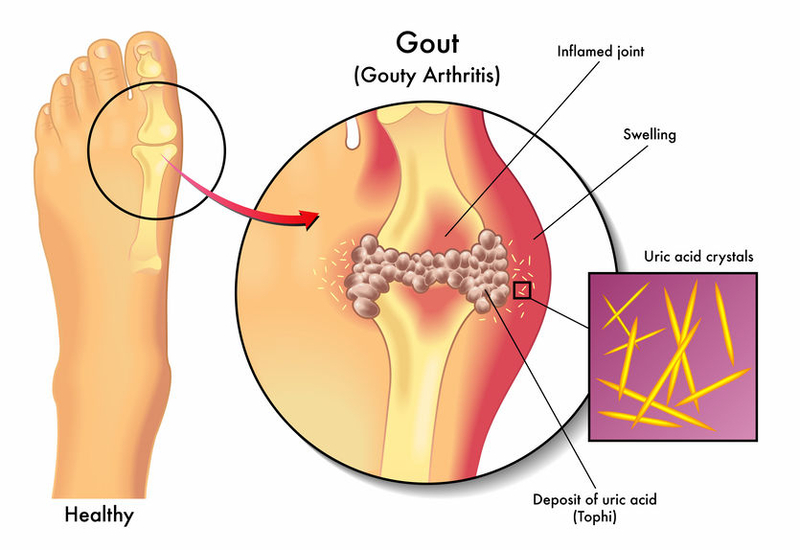 Blog - How To Manage the Symptoms of Gout with the Help of Natural Remedies? With its anti-inflammatory properties, Neem can help you get relief from the pain of a gout attack. Epsom salt baths are highly recommended for people suffering from gout. Epsom salts can lower the risks of gout as they are rich in magnesium. To give this remedy a try, mix 1 to 2 cups of Epsom salt in your bath and soak the affected joint areas to get relief. Drinking plenty of water is important for improving kidney function. Maintaining a good kidney health can, in turn, lower the risks of gout and gout attacks by reducing the build-up of uric acid crystal. Our Ayurvedic product, Orthoherb tablets, is made from natural ingredients such as Castor Plant, Adulsa, Neem, and Guggul that provides relief from all inflammatory joint complaints, including gout. Apart from protecting the synovial membrane from inflammation and damage, it reduces the swelling and enhances fluid production, thus restoring the synovial fluid balance and consistency at bone joints. Ginger is well-known for providing long-lasting relief from inflammatory conditions such as gout. You can take ginger internally by cutting 2 teaspoons of gingerroot into small pieces and boiling them in water for at least 10 minutes. However, it’s important to let your doctor know beforehand that you are planning to take ginger for your condition. Another remedy is to take a tablespoon of grated fresh ginger root and boil it with water. After achieving desired blend/thickness, let the paste cool down, soak a washcloth in the mixture, and apply it on affected joints and leave it for 15 to 20 minutes. To avoid skin irritation, make sure to test it on a small patch of skin prior to using it. A study published in Arthritis & Rheumatism, a journal of the American College of Rheumatology (ACR) found that cherry intake was associated with 35% lower risk of gout flare-ups over a 48-hour period. Having one teaspoon of fine cinnamon powder with honey twice daily before food for 3-4 months can help you get relief from joint pain.